If you’ve watched movies such as The Cube, The Descent and The Panic Room, or simply spent longer than you’d like in a lift, the feeling of claustrophobia is one you can no doubt relate to. So imagine if it was not only your job to enter areas with very limited room but also to check them in the dark and remove often unpleasant items causing flood risk problems in there. That’s all in a day’s work for me and the Confined Spaces team here at the Environment Agency. A far cry from a typical workplace setting, my ‘office’ is in various culverts and underground passageways. I am part of quite an unseen crew (rather literally, in fact) but our work plays a huge role in preventing flooding... and despite the above Hitchcock-esque billing, we love it. 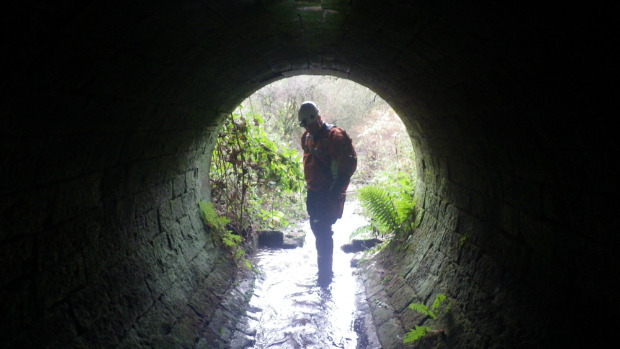 We have a regular programme of inspections which includes scheduled checks on culverts which would pose a risk if problems were to develop. This means checking their condition for things like blockages, structural problems and any signs of future issues. A large part of our work though is reactive, where, for example, a blockage has been reported and a flood risk may be developing. I’m on call 24/7, 365 days of the year for such occurrences meaning that one minute we can be enjoying family time on Boxing Day and the next we’re clearing fallen debris from a culvert exit, as happened in St Helens last year. Typically, the kind of things we remove can range from garden waste and natural vegetation such as fallen branches, to bike and car parts which have been carelessly thrown away. More unusually, we’ve retrieved not just the contents of bins but actual bins themselves and, most rewardingly, we rescued a lamb which survived, very much alive and kicking! We were also once called on to remove a tractor from a culvert... it turned out to be a child’s toy tractor! The old saying ‘out of sight, out of mind’ overlooks the fact that whatever people dispose of still has to go somewhere. So it is crucial that people don’t throw anything into streams and rivers because ultimately these actions are increasing flood risk and could even be the cause of flooding. So please check with your local authority for the best way to dispose of such items if you’re unsure. Of course this kind of work doesn’t come without its risks and the need for specialist training and skills. The safety of our staff is always our number one priority and the extensive training includes rescue training, first-aid, access training for areas of high banking and also ensures our crews achieve certain fitness levels. So the next time you’re watching a movie where the heroes are trying to escape the enclosed space and flee from whatever nasty is lurking in there, remember our Confined Spaces team here at the Environment Agency – we’re reducing flood risk by doing quite the opposite. Those with claustrophobia or lygophobia (the fear of being in a dark place) need not apply. You can find out more about the Environment Agency's work to reduce the risk of flooding here.